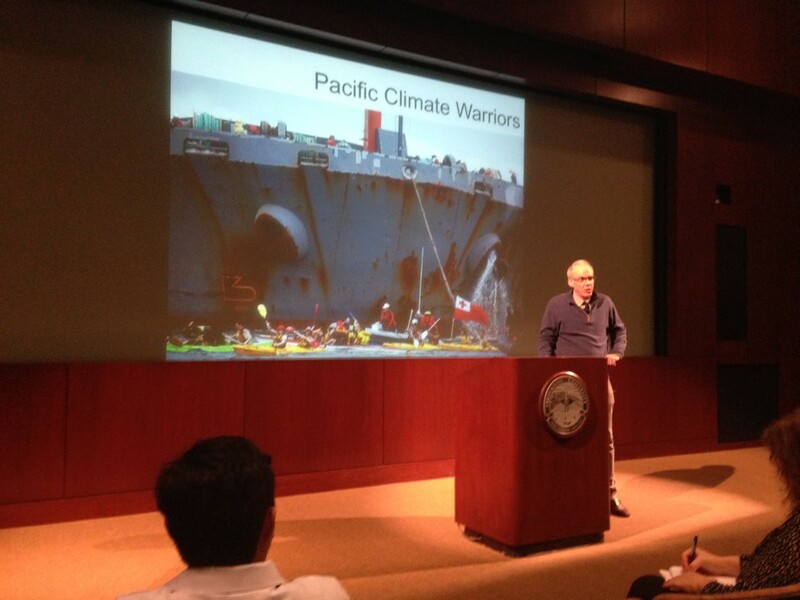 Bill McKibben spoke at Pepperdine on Tuesday night. I was deeply impressed. He has powerful narrative intuition. In the 1960’s the American environmental movement came of age and crystallized with the first Earth Day in 1970. But in the 1980’s it lost its way, as was so perfectly documented in Mark Dowie’s Pulitzer Prize-nominated book, “Losing Ground,” which every student of environmentalism should read. By the 2000’s the landscape was cluttered with big eco-corporations — meaning the large NGO’s like the big three: Nature Conservancy, World Wildlife Fund and Conservation International. They had become heartless machines employing marketing and communications professionals straight out of the corporate world bringing competitive practices against each other in the relentless search for donor dollars. By 2003 when I launched my Shifting Baselines Ocean Media Project I had grown so disgusted with the NGOs that I figured there was little hope for conservation in the long run. In 2007 they demonstrated their ineptitude when they put together their “Design to Win” master plan for combatting global warming (analyzed and critiqued by Matt Nisbet who did such a good job of pointing out their neglect for the importance of effective communication). They drove the climate bus into the ditch by putting all their chips on Cap and Trade. Because it had worked so well for acid rain, they figured it would work for climate and be an easy sell requiring almost no communication effort. Wrong. By 2010 the last piece of climate legislation had collapsed and the movement was blaming it all on the evil oil corporations when in fact they had bungled their side of it. As the environmental movement was squandering upwards of a billion dollars on their sadly misguided efforts, one guy began to emerge at the grassroots level in a more humble, 1960’s style of environment activism — Bill McKibben. I’ve been somewhat of a fan of him over the years, but on Wednesday night he spoke at Pepperdine University and I became a complete convert. He’s a unique mixture of soft spoken, friendly camp counselor demeanor, but inside there’s a firmness and conviction that makes it not surprising how successful he’s been. I first started becoming a fan when he led a group of youngsters in asking why the solar panels that were installed on the White House during the Carter Administration, then removed by Reagan, couldn’t be re-installed. That’s what I mean by 60’s style activism. He’s awesome. So before Bill’s talk I was invited to a small gathering with him where he answered questions for about an hour. I asked him my standard whiny question about the non-collaborative spirit of the big environmental NGO’s — does it have to be that way. Instead of launching into a bitchfest (as I would have done), he took a far more positive direction. He said he’s come to the realization that “it’s all about the conflicts.” He realized that when the groups get together at big meetings to waste countless hours blabbing about what to do, the non-collaboration does emerge and it can get frustrating. BUT, when you have a clear conflict and action coming together, that’s when the groups actually will join in and collaborate. In particular, he talked about the Keystone Pipeline protests that he’s led. I was actually in DC in November, 2011 and was in a taxi as I suddenly realized why we were moving so slow — we were driving through Bill’s big action of circling the White House. It was amazing and I did a blogpost on it. In the discussion some of his answers to questions were a little rambling and lacking in specifics, but when it came time for his big talk he was truly amazing and inspiring. I really can’t think of any better speaker for the environment today. He was funny, articulate, incredibly knowledgeable on religion (which was appropriate given the religious orientation of Pepperdine), and as I said, firm in his convictions. That’s the bottom line. Great leaders know narrative. They have narrative intuition. Nobody follows a bore. Bill McKibben is a great leader and the best hope for the planet.